All mergers and acquisitions (M&A) involve some degree of risk—and carry no guarantees of fulfilling the intended goals and objectives of the transaction. However, using M&A as a growth, talent acquisition, and succession planning strategy is essential and a top priority at most firms. The right deal could take your firm to the next level of success provided that you take the proper precautions before and after consummating the transaction. This webinar will address avoiding M&A risks and focusing on maximizing the deal’s ROI. •Increase ROI and the chances of a successful transaction by assessing the level of risk and avoiding M&A deal traps. •Doing what it takes to avoid big risks and placing the emphasis on the deal’s ROI and strategic implications. •Determining the right M&A strategic goals and objectives that have the best potential of maximizing ROI and minimizing risk in the future. •Avoiding the risk of a terminated transaction after many months of discussions by planning and structuring the deal terms and identifying deal breakers and dissenting partners early in the negotiation stages. Fraudulent wire transfers scams continue to plaque accounting firms nationwide. The FBI reports that fraudulent wire transfers have doubled since 2016. The new wave of scam e-mails have grown in their sophistication and appearance and no longer resemble clumsy “Nigeria” e-mails. Hear directly from the insurance company and lawyers on steps to prevent these fraudulent wire transfer scams and how to deal with a claim if this happens to your firm. Presented by Ginger Johnson & Michael J Weber - Michael J Weber Partner at Dinsmore. He focuses his practice on fidelity and surety bond claims/litigation, complex litigation, commercial law, transactional matters, general business matters/litigation and construction law. & Ginger Johnson is Specialty Claim Consultant at The Hanover Insurance Company working with Crime, Fidelity and first party Cybercrime claims up to $10M in the Management Liability Unit. Engagement Letter Usage is a vital component of CPA firm management and will be the focus of this one-hour webinar. Engagement letters provide firms with essential protective wording for your practice. In addition, they allow you the opportunity to market additional services and ultimately create a stronger relationship with your clients. This session will focus on the risk management side of engagement letters and provide participants with samples and examples designed to lower your exposure to litigation. John Raspante is McGowanPRO’s Director of Risk Management. He oversees the industry specific expertise and risk management for McGowanPRO’s accounting and financial clients. Mr. Raspante is the former Director of Compliance and Risk Management as well as the Director of Education for Graf Repetti & Co. LLP, Certified Public Accountants & Business Advisors. Prior to joining Graf Repetti, Mr. Raspante worked nine years for CAMICO Mutual Insurance Company, a provider of accountants’ professional liability insurance. Mr. Raspante’s primary responsibility at CAMICO was providing loss prevention services to the organization’s largest insured’s. 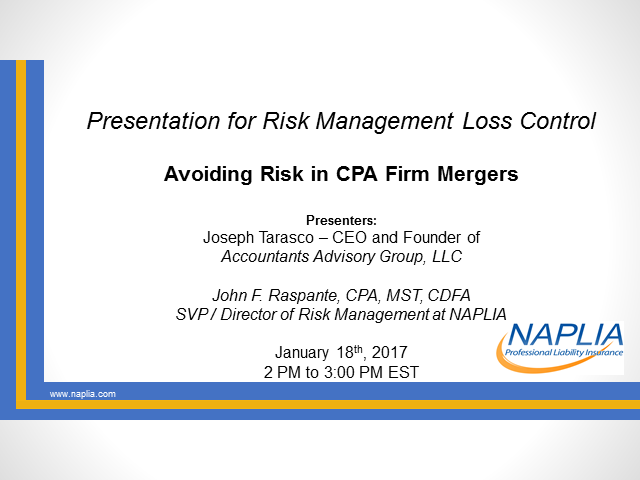 Mr. Raspante is a frequent speaker within the accounting profession on issues relating to risk management and professional ethics. He presents regularly at different conferences for accounting firm associations and CPA State Societies. He is a published author and contributor for accounting firm periodicals such as Journal of Accountancy and Accounting Today. A growing number of states are legalizing the medicinal and nonprescription use of marijuana. Nevertheless, the legalized status of cannabis at the state level conflicts with the federal Controlled Substance Act, causing significant legal risk, business uncertainty, and operational challenges for cannabis producers and distributors, as well as their accountants. This webinar will explore how CPAs serving cannabis industry clients can actively manage their business and legal risks through the use of client acceptance and retention criteria, engagement letters and related documentation, engagement planning, staffing and execution, and an understanding of applicable regulations. Adam D. Fine joined Vicente Sederberg LLC in 2013. As managing partner of the Massachusetts office, Adam represents the firm's growing base of Massachusetts adult use and medical marijuana clients, with a particular emphasis on licensing, corporate, and regulatory matters. Adam has chaired multiple CLE's relating to marijuana law and has testified before numerous municipal and regulatory bodies regarding marijuana policy and compliance. Adam also served as a consultant to Massachusetts Special Senate Committee on Marijuana and on was on the drafting committee for Question 4 which legalized marijuana in Massachusetts. Adam is frequently quoted in the Boston Globe and other local publications on the topic of marijuana legislation and policy and has emerged as a leading voice in the field being named in the 100 Most Influential People in Boston in the Boston Magazine. Before joining Vicente Sederberg, Adam spent a number of years as an associate attorney at a downtown Boston law firm where his practice focused on complex civil and criminal litigation. Any firm that has avoided attacks due to social engineering, distributed denial of service, ransomware, evasive malware and e-mail interception can count themselves lucky...but this is the year that may be changing. Cyber criminals have stepped up their game altering the threat landscape for CPA's now and in the years ahead. More than ever, accounting professionals need to keep up to date on the latest threats and adjust their game plan accordingly. This webinar will review the current threat landscape for CPA's, as well as the actions that small to mid-size firms should be taking to mitigate risk on limited budgets. Presented by Eric Hess - Eric Hess founded HLC LLC in 2014 to focus on systems compliance and information security consulting. Today, it provides an array of right sized cybersecurity assessment and cybersecurity management services to small to medium sized businesses. HLC’s clients are primarily financial services firms, but HLC is developing a focus on CPA firms and law firms. This webinar will focus on how to respond once you become aware of an actual or suspected claim or potential claim (often referred to as an incident). The session will explain how to utilize the CPAOnePro Risk Management Hotline to determine when and how to report a claim or incident to the insurance carrier, and how to proceed relative to the matter while awaiting the carrier's response to your report. The session will also explain when and how to invoke the subpoena coverage within your policy. Ralph Picardi is the managing member of PICARDI LLC specializing in advising accountants, lawyers, and their insurers in matters of coverage, and in matters of loss control through hotlines, seminars, risk management audits and publications. Stay ahead of the game and listen as Attorney Gary Kessler shares details of five cases that will surely make you think twice about some of the practices you have in place at your firm. You will leave this webinar with an understanding of the types of claims that happen to firms like yours. Wilhelm Dingler has provided legal counsel to thousands of professionals over the past 30 years. During this webinar Attorney Dingler will discuss the Top Ten Trouble Spots for Accountants. Objectivity and personal contact with an audit client. Lack of an engagement letter. Lack of clarity of the work to be performed. Tax advice beyond area of expertise. Lack of internal procedures for follow-up. Advising more than one party to a transaction. Lack of disclaimers in prepared financial statements. Failure to keep current in ones education and training. In an effort to expand our relationship with our family of TPA insureds, we have teamed up with NAPLIA and The Hanover Insurance Group to bring you an online ERISA bonding option for your plan sponsor clients, that's low cost and simple to use. These days it’s not unusual for headlines to highlight matters where professionals such as CPAs are accused of malfeasance in work performed for clients. But, still many CPAs carry liability coverage as a necessary “but I will never really need it” evil that they may carry more out of habit than real risk. You may even think it—meaning lawsuits or claims—can't happen to you. After all, accounting seems like a fairly predictable industry. While that may even be true, even the best practitioners can find themselves caught unaware. In fact, this view can be lethal to a practice. Savvy CPAs know that as the profession expands the services it provides in an effort to compete in a global economy, their exposure may also increase, or at least change. The types of risk simply evolve along the way, and so professionals should be prepared. From information security to new laws and policies, it's critical to stay on top of the trends. While predicting risk trends in an uncertain future is never easy, especially with respect to a profession with such diverse talents and services, this timely and informative webcast will discuss some of the trends giving rise to risk for today's accounting professional, and will also provide you with guidance and suggestions for reducing the likelihood of an engagement problem down the road. Tax claims are underappreciated by most practitioners. McGowanPRO has created this channel of live and recorded webinars which cover a variety of topics hosted by industry leaders with insights on the latest developments in law and risk management issues.